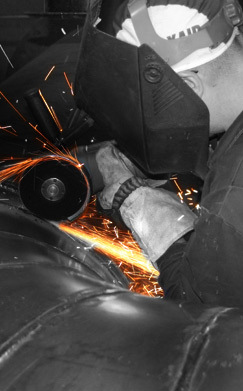 Since 1984, ULC's good reputation in industrial equipment manufacturing has grown thanks to its ability to fabricate parts to the client's specific requirements. Owing to the right tools and a really good team, ULC can answer any request from their clients. We can manufacture almost any industrial welded parts by unit or small quantity. Our expertise helps us to fabricate practical and solid complex parts of all dimensions. We can work almost any steel, including stainless steel and aluminum. We can move parts up to 7 tons and assemble indoor, equipment up to 100' x 14' x 14' in dimension. Our quality control is very strict, all material is backed by mill test from the supplier. Our reward is our Canadian Welding Bureau (CWB) certification. Our process controls allow us to follow the most complex plans, and to deliver equipment easy to assemble at your site. Industrial equipment with "ULC-metal & fabrication" seal are now installed everywhere in North-America and Asia.